Common winter feeder birds – H.I.C.O.P. These birds are seen almost daily at our feeders in the winter which is perfect for doing bird identification with Cubs or Scouts. We have identification sheets to help them. 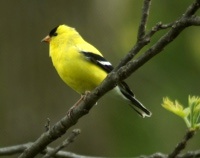 Goldfinches are another common visitor to our feeders. Their yellow colour adds a nice brightness to the feeders during a rather drab winter. Flocks of Goldfinches fly in a distinctive undulating pattern. They love dandelions and that is likely why I have so many Goldfinches around my home. These very curious year round residents keep the forest around the HICOP’s bird feeders alive. In the winter they can be enticed to land on an outstretched hand if it contains sunflower seeds. Bring your own seed or ask us for some. 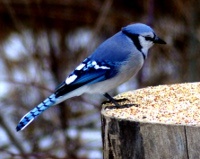 Blue Jays are large and aggressive enough to chase squirrels and even cats from backyard feeders. They terrorize smaller birds but we nevertheless enjoy seeing these beautiful and vocal visitors. 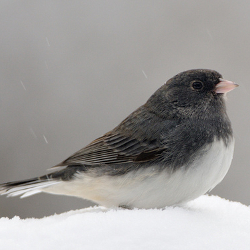 This winter visitor is one of Ontario’s most common birds. It is a ground feeder so it is most often seen scrounging underneath the bird feeders for seed dropped by perching birds. We have seen two pairs of Downys and one of the larger Hairy Woodpeckers at our feeders. The Downey is probably the tamest of all the woodpeckers and they seem quite tolerant of us. 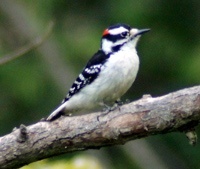 These are often confused with their smaller cousins the Downy Woodpecker. 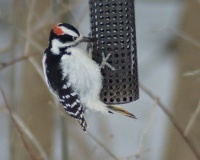 This male will hog our feeder for long periods of time. Cardinals are one bird that is easily identified by most people in southern Ontario. The male with its bright red plumage is easily spotted from a long way off. 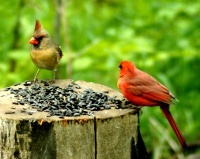 A male and female cardinal remain together year round and can often be heard calling to each other in the winter. 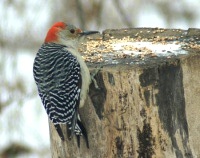 This is the rarest of Ontario’s woodpeckers so it was a treat to see one near our feeder. Their head and breast feathers are so soft that they almost look like fir. It is often considered a pest because it eats fruit as well as the bugs and seed commonly eaten by other woodpeckers. 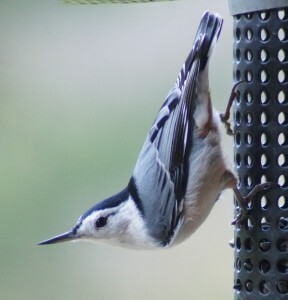 The white breasted nuthatch is another common visitor to our feeders. Both nuthatches are easily spotted on tree trunks because of their habit of going head first down the trunk. Unlike their red-breasted cousins, which are smaller, these have a white underside and no black strip across their eyes.